Rock Imager 2.11 includes several enhancements to existing features that will make your work easier, as well as image improvements for UV customers, faster plate imaging for Rock Imager 1000 Dual Imager customers due to optimized plate handling, and a faster startup time for SONICC Benchtop customers. Formulatrix engineers have also made 27 other changes that won't be obvious to you, but change behind-the-scenes operations for a better overall experience. If you're curious about these additional changes, go to the website to view the latest release notes. ‘Image Interesting Drops’ from anywhere! Previously, imaging interesting drops required that the plate containing the interesting drops was already at the imaging station. Now, you can find the plate as you normally would, and execute the Image Interesting Drops command from the right-click menu. Rock Imager will move the plate to the imager at the earliest possible time and image your drops. See the imaging method for future imaging sessions on the Scheduling tab. We’ve added an ‘Imaging Mode’ column to the Scheduling tab, so you can now more easily see not only when a plate is scheduled to be imaged, but how the plate will be imaged. See how many images RIP is waiting to process. 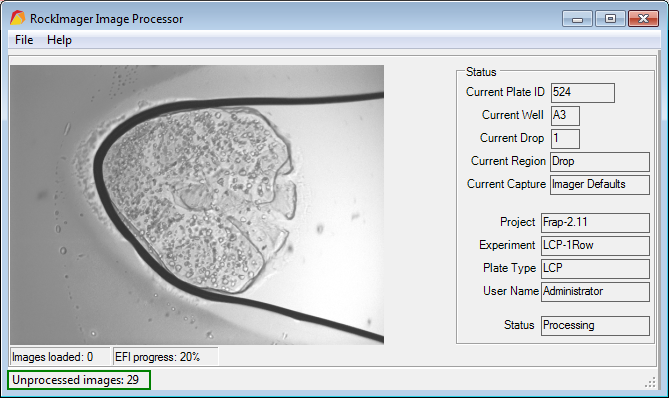 Rock Imager Processor now tells you how many images are waiting to be processed, giving your more insight into behind-the-scenes operations -- and helping you figure out where your images might be if they’re not showing up in Rock Maker. Clear drop locations -- and their overrides -- from Rock Imager. Now when you clear a drop location in Rock Imager, you will be asked if you also want to clear the drop location override created in Rock Maker -- if there is one. Include a note when you send log files to support. Sending log files to support to report a freeze or crash? Now you can type in a note to accompany the log file, so we have a better understanding of what you were doing when the incident occurred. Behind-the-scenes license checks to keep your Rock Imager software current. Rock Imager now starts checking our servers for renewed license status 14 days before your license is set to expire. If a new license is found, Rock Imager will update your license automatically so that you don't miss any software updates. Get your manually scheduled plates imaged, even if Rock Imager shuts down. In previous versions of Rock Imager, if the hardware or software shut down for any reason then manually scheduled plates were lost from memory. Now, Rock Imager remembers all of your manually queued plates, even if your hardware or software crashes, so your manually scheduled plates are still imaged the way you originally planned. Better image contrast no matter the objective. Rock Imager now attempts to deliver the best contrast when imaging in UV by automatically matching the objective with a certain exposure time. Faster imaging due to better plate handling. Plate handling has been optimized so that there is less downtime between plates -- while the first plate is imaging, Rock Imager will retrieve the next plate and wait for the first plate to finish. Then, it will retrieve the first plate from the imaging station, put the second plate in its place, and return the first plate to its storage location. Meanwhile, imaging has already started on the second plate. Faster startup time. The startup sequence for SONICC Benchtop has been optimized so that you can begin using the Rock Imager software while the SONICC laser is warming up. If you attempt to engage the laser for imaging purposes before it is ready, a counter will appear displaying how much more time is needed before SONICC imaging can begin.